Trikes and (odd) bikes. : 17th August 2017 A total Charlie kills innocent woman. 17th August 2017 A total Charlie kills innocent woman. Thursday 17th 60-70F, 16-21C, light winds and warm. I walked past the marsh to the amusement of the ducks. Just beyond, along the track, three deer were grazing. I tried to go out around them on the harvested field but they bounded off around the corner of the marsh wood and out of sight. Eventually I found them hovering near the edge of the real forest. Whereupon they scattered in wildly different directions. There was a strange sound of deep panting in the woods. As if some vast animal was breathing slowly and steadily. Absolutely no idea what it might have been except, perhaps, more deer. What have fixies, fashionistas and fixers got in common? No brains. Ask Charlie Alliston. The genius who removed his front brake to be a copycat of all the other brain dead fuckwits riding fixed wheel bicycles on the roads without front brakes. The genius who killed a woman because a front brake "makes no difference." A fixed wheel uses the back wheel as a piss poor brake with very low efficiency via the drive train. Now assume a ridiculously low handlebar position and your weight is already well forwards over the front wheel. What happens when you apply any back brake? You throw your weight further forwards. Simultaneously unloading the back tyre of its vital adhesive qualities with the road. In other words you skid. Leading to further loss of braking and probably lose directional control into the bargain. In serious cycling terms this is called "being a total fuckwit." Try riding fixed in the wet and see how much braking you can apply! Makes no difference? Seriously? On a cycle track, everybody is going the same way. Everybody has no brakes to avoid causing endless rear-enders. So track cyclists have to develop advanced skills, lightening fast reactions and learn to rapidly avoid obstacles like fallen cyclists. If you fall off you have a decent chance of sliding out of trouble on smooth tracks. Or into trouble. A cycle race track is nothing like a public road. Which has vehicles, countless obstacles, distracted pedestrians, potholes, drains, street furniture and [hopefully] lots of careful cyclists. Charlie may be in denial but he is completely wrong. It is a legal requirement to have a front brake and has been for probably a century. The law is there for a very sensible reason. Protection of the public from total fuckwits who ride with no front brakes. Total fuckwits who give real cyclists a very bad name! Total fuckwits who berate a badly injured woman who is lying dying. Simply because the pretend cyclist blames everybody else for his own fuckwitted behaviour. He claims that after working for three cycle messenger companies that he still had no idea that his brake-less machine was illegal. Keen cyclists are totally obsessed and never stop talking about their bikes and those of other riders. It is completely and utterly unimaginable that the illegality of riding without brakes was not a constant topic of conversation amongst his fellow riders from day one. How else would he know about removing the brakes in the first place? Because he watched videos of other fuckwits/sociopaths riding dangerously on public roads for the adrenaline rush and drooling admiration of his fellow copycats. It should be made clear that this particular idiot has not been found guilty of anything, as the trial continues. My argument, as a lifetime cyclist, is that he was a bad accident just waiting to happen. To somebody else! His "accident" just happened sooner and quite probably caused the death of a pedestrian. It could easily have been a petrol tanker forced to swerve in a city center by a fuckwit cyclist riding fast and erratically without brakes. All because he's seen the American cycle messengers behaving like raving psychopaths in films. I saw a film about bike messengers on Netflix that and it was so totally unrealistic that the screenplay was obviously written by a non-cyclist. As was the director and everybody else involved. How else could they have committed such ridiculous nonsense to film? I rode fixed wheel extensively in my younger days and knew the the thrill of braking with the rear wheel. But any fast cyclist quickly learns that good brakes make you much faster overall. Brakes are vital insurance against meeting the unlikely and allow you to travel faster with much lower risks as a result. The more powerful the brakes the less you have to use their full power because they are incremental. I found another British newspaper reporting on the trial which says the police tested the "braking" of the track bike and found it needed 36' to stop. A racing bike took 12' and a mountain bike only 9'. I wonder whether this complete Charlie used clip-less pedals or no clips at all? How much braking does that offer compared with our earlier practice of using shoe plates, toe clips and traps? Once locked in we could not remove our feet if we wanted to. Not without bending down and loosening the toe straps.The pictures online are too poor to see the pedals themselves but toe straps were visible. Fast cyclists quickly learn that gears are much faster than fixed wheel. Single speed bikes are almost always in the wrong gear, even on the flat. So you have to sprint up to speed and then ride faster all the time and take foolish risks to maintain a similar average speed to a similarly fit cyclist with gears. I rode for countless miles with fixed wheel between 46 and 153 inches in my youth. 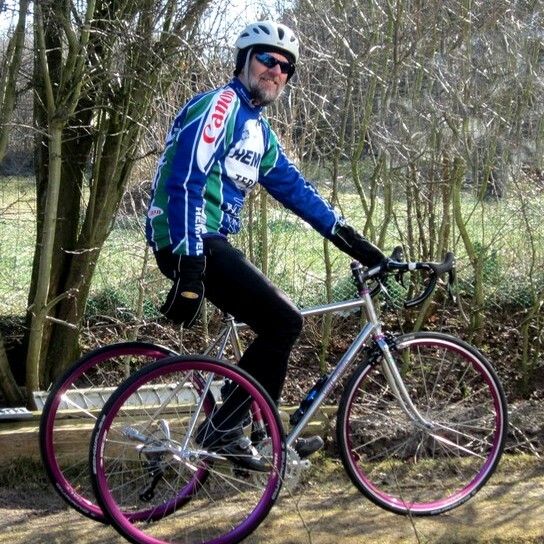 Try riding down Wellsway on a 46" fixed wheel! You think you can spin? Though I rode mostly in the low 80s" for general riding or 111" for riding fast between cities. In a hilly city like Bath or Bristol you can't ever be in the right gear with fixed wheel. Riding without brakes would be suicidal from the moment you firmly fastened your toe straps with your soul [sic] slotted deeply into the plates and clips. Mind you, we didn't need 'girly' names for fixed wheel back then to prove we were fashion victims. It was just called riding fixed or fixed wheel. It was popular for early season training and learning to spin the pedals so fast that you never bounced on the saddle. No matter what the gear or the speed. I'm now looking forwards to a new law which allows fuckwit cyclists, without front brakes, to compete on their braking and riding skills in time trials on some of the steepest and narrowest descents which Britain has to offer between dry stone walls. It could easily become a live TV sport show with the usual 17 BBC celebs simultaneously commentating. Or discussing their designer dress code for attending the following massed funerals. It could be called "Celebrity Cycling Darwin Awards. "© We could all look forward to the weekly "have a go" by a BBC sleb showing how easy it is. If only!